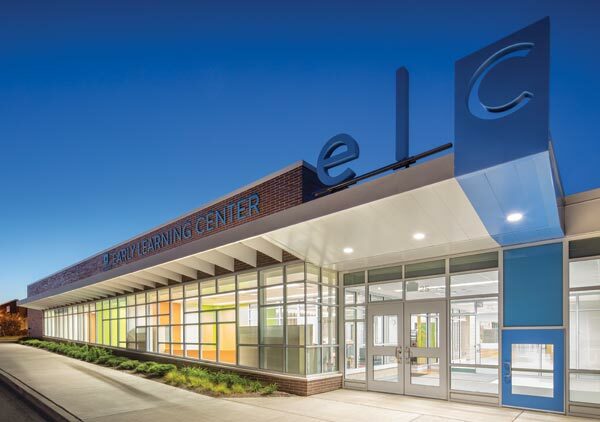 The child-sized blue door at the CCSD59 ELC entry gives students a comforting first impression — this facility is designed for them. Brick above and below the glazing complements the adjacent middle school. The classroom has always been and will continue to be a core learning space. But why should the learning stop there? Since early learners are constantly on the prowl for new information, today’s early learning centers (ELCs) should offer learning opportunities around every corner. Traditionally, the school corridor has functioned solely to transport students from one classroom to another. That is a wasted opportunity. Breakout areas just outside of classrooms support small-group activities and specialized instruction. They also create a sense of community and arouse curiosity among passing students. At Addison ELC, stone identifies non-classroom spaces while brick-clad classroom wings feature alternating window heights. At the Community Consolidated School District 59 (CCSD59) ELC in Mount Prospect, Ill., designed by Legat Architects, the main corridor houses three “exploratories.” These light-filled breakout areas feature stimulating shapes and colors, wall materials that welcome touch, and views to learning gardens. Secondary corridors offer “therapy stairs” for climbing practice or seating, as well as miniature stages for small-group performances. A common shortcoming of the conventional ELC classroom is a lack of space for students with special needs. Teachers often resort to taking students to a corner, where they are easily distracted by other activity. Intervention spaces between classrooms solve this problem. Typically, such spaces house a small table and/or a desk, while windows enable observation of classroom activity. When a speech therapist, for example, works with a student, that student gets the distraction-free individualized attention she needs but still feels connected to her classmates. Integrated therapy rooms between classrooms at the Addison ELC maintain views into the larger classrooms. 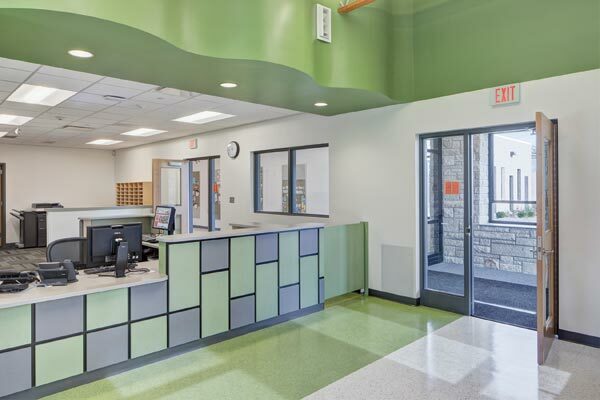 According to Dr. Erin Alexander, principal of Addison ELC in Addison, Ill. (also designed by Legat Architects), integrated therapy rooms between classrooms are a favorite space among staff. Therapists and teachers use the spaces for small-group work or one-on-one instruction. “Since the new design with each classroom having a bathroom and connected therapy room, we gained back 20 to 25 minutes of instructional time each day,” says Alexander. 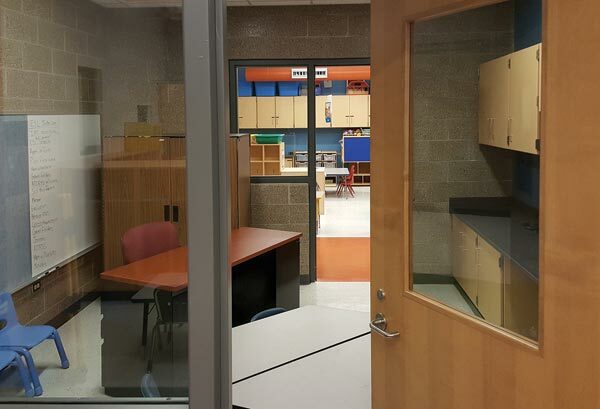 Motor skills spaces like that at the CCSD59 ELC offer natural light and views. In their quest to identify façade materials that are durable, reminiscent of home, and playful, ELC designers often turn to masonry. Visually and tactilely, it offers a sense of familiarity, as many students live in or near brick homes. Additionally, masonry’s variety of colors and textures enables designers to break down an ELC’s mass and therefore make is less intimidating. Something as simple as alternating colors can make a big difference. For instance, façade brick color shifts between classroom pods at the CCSD59 ELC. Long, horizontal striations of brick with a different texture and color enhance the effect. Additionally, the brick unites the exterior by forming a base wrap beneath metal or glass walls on other parts of the facility. At the entry, the brick above and below the glazing pays tribute to the entrance of the adjacent middle school. A colorful welcome center at the Addison ELC allows parents to interact and engages children with learning before they step foot in a classroom. 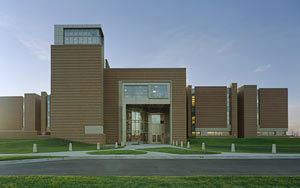 The Addison ELC’s more conventional façade alternates between brick (classroom wings) and stone (offices). Classroom façade windows dance up and down — some are eight inches above the floor, while others rise two feet. 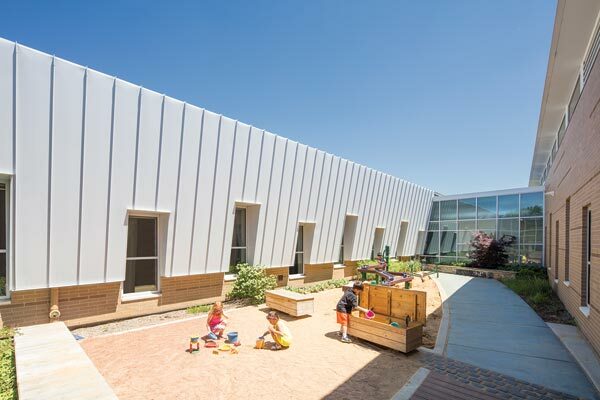 This creates a playful pattern, plus gives students views outside. This same window pattern appears on the metal walls (with brick base) of the CCSD59 ELC. Students learn outside the classroom in three corridor “exploratories” at the CCSD59 ELC. Research reveals that when students go outside, their memory, mood, concentration, and creativity improve. Thus, the effective ELC offers outdoor spaces that promote learning. Design discussions for the CCSD59 ELC began with the outdoor spaces. Three community workshop-inspired themed gardens not only offer safe outdoor play areas, but also encourage interaction and continued learning. A sensory garden is one of three learning gardens at the CCSD59 ELC. Note the brick at the base of the metal wall and darker striations within the brick. The sensory garden, for instance, features a large sand area and water tables. Fine arts and nature gardens round out the mix. Teachers have used the learning gardens to support a variety of lessons: identifying climatic and seasonal changes, comparing wet and dry sand, and preparing a garden. CCSD59 ELC’s enclosed main courtyard offers smaller zones for introverts and larger ones for extroverts. Kids enjoy riding their scooters on the rising surrounding pathway, the high point of which includes an embankment slide. The central courtyard at the CCSD59 ELC. The brick façades of higher masses (e.g., offices, multipurpose space) tie in with the adjacent middle school. 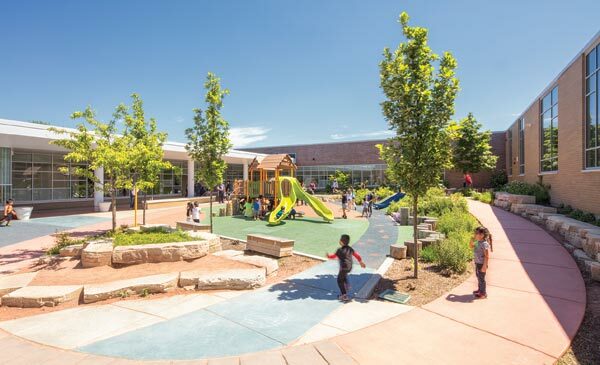 A post-occupancy evaluation of CCSD59 ELC confirmed the value of outdoor spaces — 75 percent of respondents spent at least one-and-a-half hours a day in the outdoor play spaces. Additionally, the majority of respondents reported that the outdoor playground and gardens were their favorite spaces. Research shows that pre-K students learn best through play. Thoughtfully designed ELCs bring more play into the instructional day by taking into account those days when weather prevents outdoor activities. The solution typically comes in the form of an interior motor skills area. 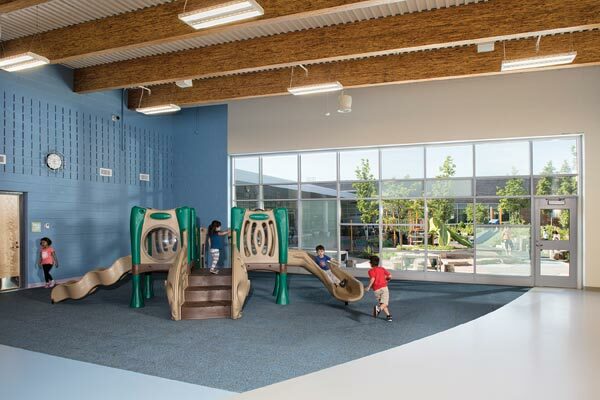 These large, open, multipurpose areas give students an opportunity to work off energy and participate in creative play. Typically, the rooms have affordable concrete block walls to stand up to abuse, while large windows or glass walls offer views to outdoor spaces and bring in natural light. color break down the scale and create a playful appearance. When it comes to education, pre-K students represent the widest range of mental and emotional readiness. 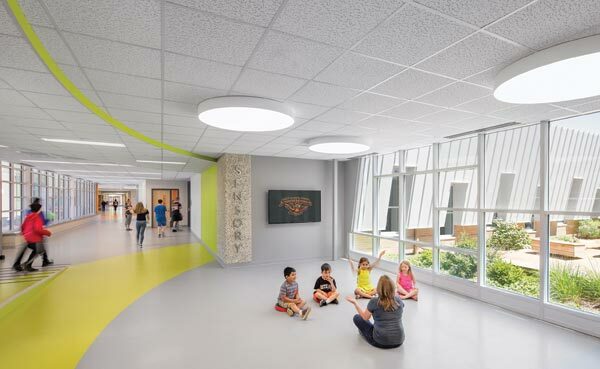 The architect’s challenge is to create a comfortable facility that responds to this vast array of students and instills the joy of learning in each of them. Addison School District 4’s early learning programs, previously distributed throughout the district, were consolidated in one facility custom-designed for pre-K students. When it comes to early education, design clearly makes a difference. Robin Randall, AIA, LEED AP BD+C (rrandall@legat.com) is director of pre-K–12 education and Doug Ogurek, LEED AP BD+C (dogurek@legat.com) is a member of the pre-K–12 team at Legat Architects. Educational facilities often use brick in their design. 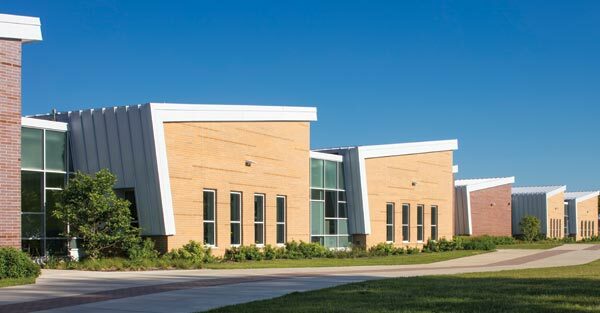 Check out the story of Pine Hall Brick being used in the Jemison High School project in Huntsville, Ala., by visiting www.masonrydesignmagazine.com. Five years ago, the University Center of Lake County, a partnership between 18 Illinois colleges and universities, operated classrooms in shared buildings. However, it had no core facility – no “face” to show the community. The first facility of its kind in Illinois, the $19.8-million University Center of Lake County provides that face. The 91,000-square-foot, stand-alone academic center enables the organization to offer degree and workforce development programs from all its partner institutions under one roof. 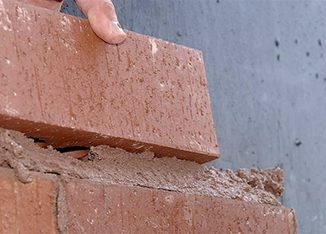 Since the mortar joint makes up about 20 percent of a brick structure’s surface area, coloring the mortar enhances the building’s appearance. Solomon Colors’ Mortar Colors are available in unique, pre-weighed and pre-measured amounts to assure accurate color consistency.